BusyCal 2.3 is not compatible with OS X 10.9 or later. Sync Services, an underlying framework on OS X used for syncing local calendars in BusySync with OS X Calendar, no longer exists in OS X 10.9 or later. If you run BusySync on OS X 10.9 or later, an error message will appear stating that syncing has been disabled. This is happening because BusySync is unable to communicate with Sync Services, which no longer exits. Clicking the Yes button to enable syncing will have no effect and the dialog will repeatedly appear. You must reset BusySync as described below to put an end to this pesky error message. 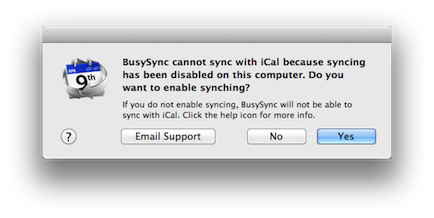 BusySync 2.3 is not compatible with OS X 10.9 or later, as it requires Sync Services for syncing with OS X Calendar. If you upgrade to OS X 10.9 or later, you will have to discontinue using BusySync. We recommend migrating to a cloud-based service like iCloud, Google or Exchange and upgrading to BusyCal 3. Before you upgrade to OS X 10.9 or later, you should reset BusySync. Otherwise, you will end up with orphaned calendars that will need to be manually cleaned up (instructions below). Google calendar subscriptions — If you are subscribed to any calendars on Google, those calendars will be unsubscribed and deleted from your Mac. Calendars published to Google — If you are publishing any calendars to Google, those calendars will be orphaned on Google. That means they will appear on Google but will no longer be syncing with your Mac. You will need to either delete the orphaned calendars on Google, or delete the local orphaned calendars on your Mac. LAN calendar subscriptions — If you are subscribed to any calendars on the LAN, those calendars will be unsubscribed and deleted from your Mac. Calendars published on the LAN — If you are publishing any calendars on the LAN, those calendars will be unpublished and deleted from any other Macs on your LAN that are subscribed to those calendars. If you do not reset BusySync before upgrading to OS X 10.9 or later, you will need to clean up orphaned calendars as described below. If you do not reset BusySync prior to upgrading to OS X 10.9 or later you will have to perform some clean up. Any calendars that were synced with BusySync will be orphaned, meaning that the calendars will exist in OS X Calendar and no longer be syncing over the LAN or with Google. Following is a description of various scenarios resulting in orphaned calendars and how to clean things up. If you have not already done so, you must reset BusySync, before performing the steps below. LAN calendar subscriptions — LAN Calendars that you are subscribed to with BusySync will be orphaned in OS X Calendar, where they will appear as local calendars under ON MY MAC. You will need to delete the orphaned calendars by control-clicking on them in OS X Calendar's left sidebar under ON MY MAC and choosing Delete. The source calendars will remain intact on the computer that is publishing the calendars on the LAN. Calendars published on the LAN — If you are publishing any calendars on the LAN, those calendars will be unpublished when you reset BusySync and will be deleted from any other Macs on your LAN that are subscribed to those calendars. If they are not automatically deleted from other user's Macs, they may have to be manually deleted. Google calendar subscriptions — Google Calendars that you are subscribed to with BusySync will be orphaned in OS X Calendar, where they will appear as local calendars under ON MY MAC. You will need to delete the orphaned calendars by control-clicking on them in OS X Calendar's left sidebar under ON MY MAC and choosing Delete. The source calendars will remain intact on Google. If you are running OS X 10.11 or later, we recommend upgrading to BusyCal 3.